Recently Kumaran Design submitted an entry to the 100 MILE HOUSE design competition in Vancouver, BC, Canada. The stated goal - to rethink the concept of the regional house and the way we live. 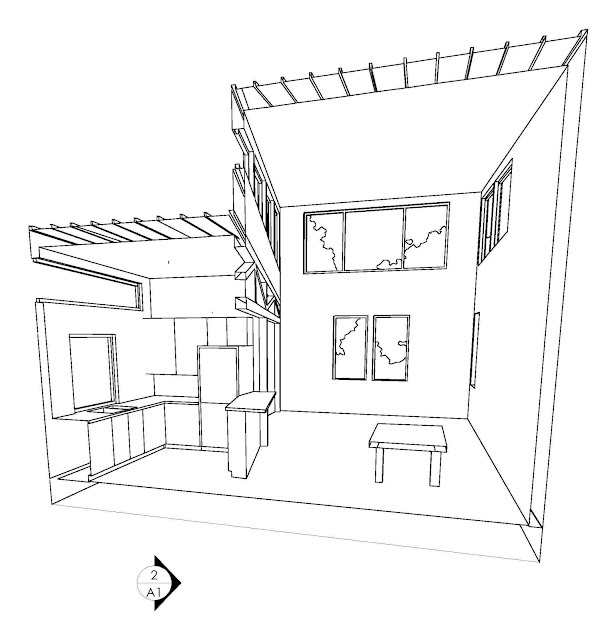 The program - design a house for up to 4 people with a max. area of 1200 sf using only materials and systems made/ manufactured/ recycled within 100 miles of Vancouver, BC. A hypothetical flat, corner lot would be used. Submissions were to demonstrate local social, technological, economic, environmental and aesthetic sustainability. This house is designed to be simple and lively. 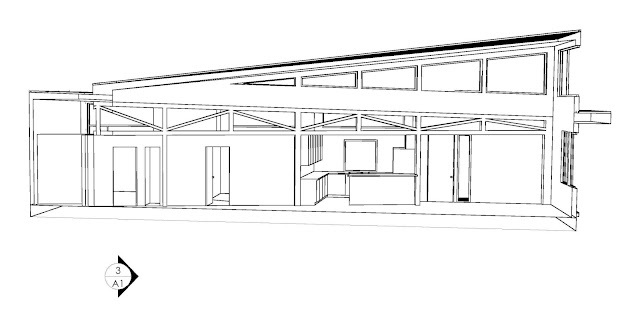 Simple as a basic rectangle yet energetic by the split diagonally, vertically, and up the roof slopes. The form is spacious, defining public and private areas. Natural light extends deeply to both. The home should be bright and uplifting through the long gray winters. 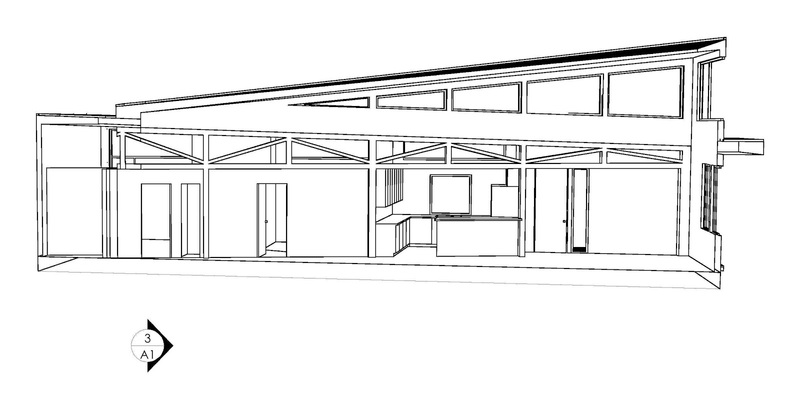 As a passive solar/passive house hybrid, the home will be comfortable and energy efficient. SIPS panels and high performance windows are the thermal skin. To avoid summer overheating, 3 native maple trees are planted. Heating to be hydronic radiant floors. Air quality via heat recovery ventilator. SIPS panels also provide the structural core. An exposed heavy timber truss carries the SIPS panels at the taller form down the split. The exterior is to be either cedar shingles, light gray in color, or stucco, white color. The entry is strongly defined by a salvaged cedar log as the corner post supporting the covered porch. The porch ceiling is sky blue and the door is bright yellow. At the interior, to enhance the light, walls are to be white, smooth dry wall. The floors are natural recycled fir. The ceilings are natural recycled cedar. This house is designed to be comfortable and notable. Do inquire for more details about the design submitted.